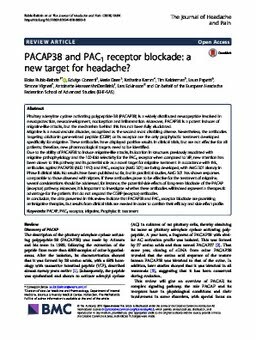 RePub, Erasmus University Repository: PACAP38 and PAC1 receptor blockade: a new target for headache? Pituitary adenylate cyclase activating polypeptide-38 (PACAP38) is a widely distributed neuropeptide involved in neuroprotection, neurodevelopment, nociception and inflammation. Moreover, PACAP38 is a potent inducer of migraine-like attacks, but the mechanism behind this has not been fully elucidated.Migraine is a neurovascular disorder, recognized as the second most disabling disease. Nevertheless, the antibodies targeting calcitonin gene-related peptide (CGRP) or its receptor are the only prophylactic treatment developed specifically for migraine. These antibodies have displayed positive results in clinical trials, but are not effective for all patients; therefore, new pharmacological targets need to be identified.Due to the ability of PACAP38 to induce migraine-like attacks, its location in structures previously associated with migraine pathophysiology and the 100-fold selectivity for the PAC1 receptor when compared to VIP, new attention has been drawn to this pathway and its potential role as a novel target for migraine treatment. In accordance with this, antibodies against PACAP38 (ALD 1910) and PAC1 receptor (AMG 301) are being developed, with AMG 301 already in Phase II clinical trials. No results have been published so far, but in preclinical studies, AMG 301 has shown responses comparable to those observed with triptans. If these antibodies prove to be effective for the treatment of migraine, several considerations should be addressed, for instance, the potential side effects of long-term blockade of the PACAP (receptor) pathway. Moreover, it is important to investigate whether these antibodies will indeed represent a therapeutic advantage for the patients that do not respond the CGRP (receptor)-antibodies.In conclusion, the data presented in this review indicate that PACAP38 and PAC1 receptor blockade are promising antimigraine therapies, but results from clinical trials are needed in order to confirm their efficacy and side effect profile.